In the early 20th century, the construction technology and building related businesses in the United States of America (USA) were on the upswing with the markets. Lumber mills were developing new large scale tools to efficiently cut lumber down to accurate sizes. Railroad and cargo ship companies were increasing the areas served with their services and expanding across the USA. This provided building material supply companies with the opportunity to expand their operations and provide materials to contractors and other companies. Soon, entrepreneurs saw an opportunity in the housing market to combine the growing precision and efficiently of lumber mills with the other building material suppliers to create standardized houses as products. The vision of these new kit house companies was to provide high quality houses to the working class and upper class families of its time. These kits would come with the various necessary building components to build the entire house on site including nails and finish paint. Prospective homeowners would need to separately build a foundation on their site for which plans were available from the kit house companies. These kit houses were built with quality materials of their time because the lumber milling technology and the wood workers were able to precisely cut, modify, and build all the separate components that would eventually come together as a balloon frame and be clad with the façade materials. Examples of these kit houses could be seen in nearly every neighborhood around the USA. Sadly, kit house companies began to fade by the latter half of the 20th century due to the economy, continually developing building technologies, and building material suppliers emerging in nearly every city and town. Reviewing the history of the early kit houses and their development over time, it was clear that the stick-built balloon frame typology was the focus of the companies. This is likely due to the ease of delivery, construction, and economy of its time. As transportation and construction technologies continued to evolve, contractors had access to additional tools and machinery that allowed heavier building components and materials to be erected into place on site. By the mid 1950’s, new housing typologies began to emerge with new aesthetics and building materials of its time. Steel and glass had a larger presence among architect designed kit houses. This can be seen throughout the Case Study house program led by John Entenza in the arts and architecture magazine series. There are many well-known case study houses in this experimental series, but the one that I’ve focused on for this project is the Eames Case Study House 8 (Eames House). The Eames House was designed by and for the architects Charles and Ray Eames who are known for designing furniture using industrial processes. Their focus has been to bring modern design to the masses through the efficiency of designing and fabricating furniture using new industrial machinery. 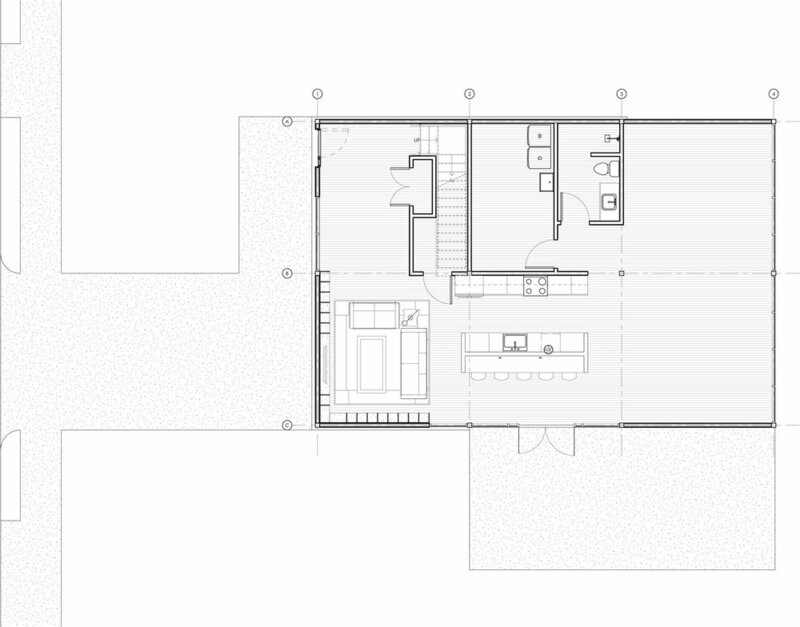 That idea carried into their proposal for the Eames House which is comprised of off the shelf building materials. From structural steel framing and glazing to steel joists and manufactured roofing systems, their proposal used readily available materials to create a modern house. For the 21st Century Kit House, its design starts with ideas that are very similar to Charles and Ray Eames’ house where the structure is based on a standardized grid and the building elements are standard building materials that are readily available. 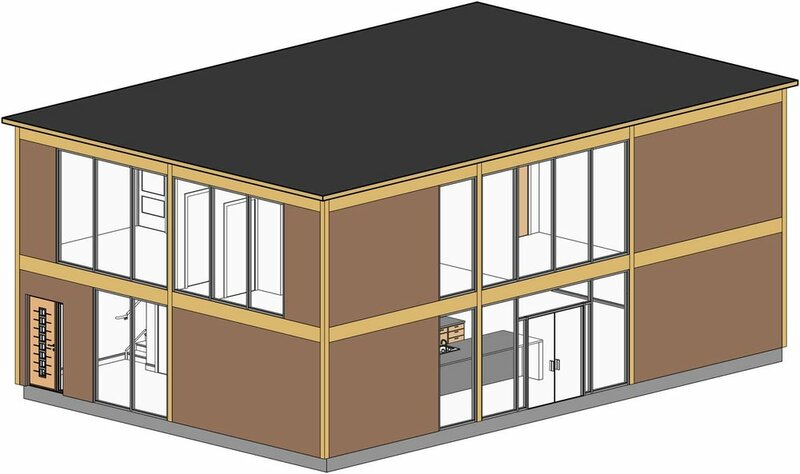 The structure of the 21st Century Kit House is glulaminated timber columns (approximately 10’-0” per floor) and beams (approximately 16’-0” between beams). This system sits on foundations that are based on the best practices for the climate zone where the house is located with a slab on grade. As the residents’ family grows, additional foundations, columns, and beams can be added to extend the house. Once the foundations are set and the frames are erected, the roof can be installed which would also be based on the region where the house is located to either a sloped or flat roof. In this option, the proposal shows a flat roof. Between the columns and beams along the exterior of the house, prefabricated infill panels would be lifted into place and anchored to the columns and beams. These infill panels are part of the 21st Century Kit House’s product lines which range from transparent glazing (clear glass) to translucent glazing (semi-clear and colored glass), and wood veneer, recycled colored plastics (solid white in this proposal), metal, vegetation, and so on. These panels can be easily replaced and upgraded over time with panels that are made from recycled components and materials with a low carbon footprint. The interior of the house is comprised of a plumbing core, stairs, and rooms with dimensions based on the centerlines of window mullions. This proposal is an 1,800 square foot house with 4 bedrooms, 2 full bathrooms, and a mixed utility and laundry room. The 21st Century Kit House focuses on flexibility and growth where the structure and exterior cladding can be installed first with interior partitions and rooms added later. This provides the owners with the opportunity to budget, finance, and expand their houses over time. Based on the ever evolving construction technologies and building materials, the 21st Century Kit House proposes a typology that is flexible with interchangeable parts and components that could be updated over time. The house becomes a product where various components are systems that can and will evolve with technology to provide owners with the ability to easily adapt their homes with their lifestyles. The rigid components of the house will always remain the same where the glulaminated structure and foundations are consistent throughout the evolution of the house. 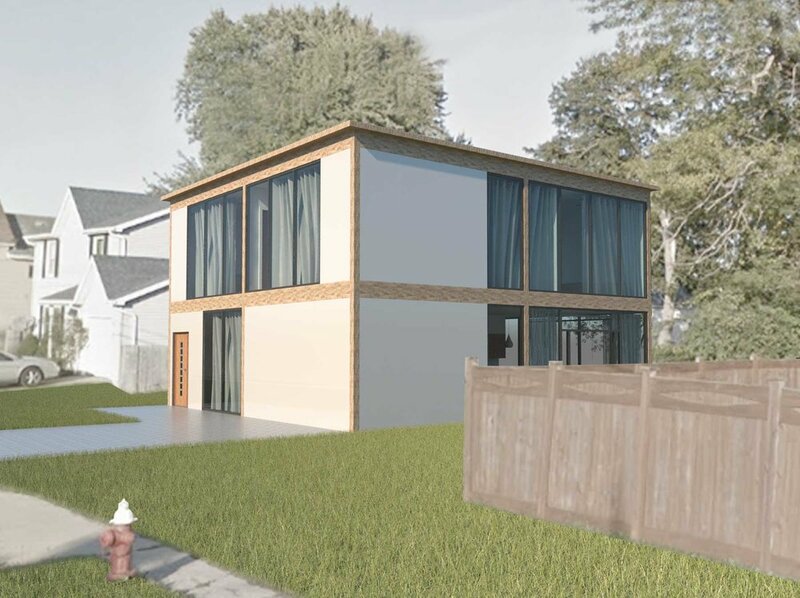 The 21st Century Kit House is not just another housing typology proposal, but also a product company and business model that helps owners adapt their houses to the changing times and their lives.